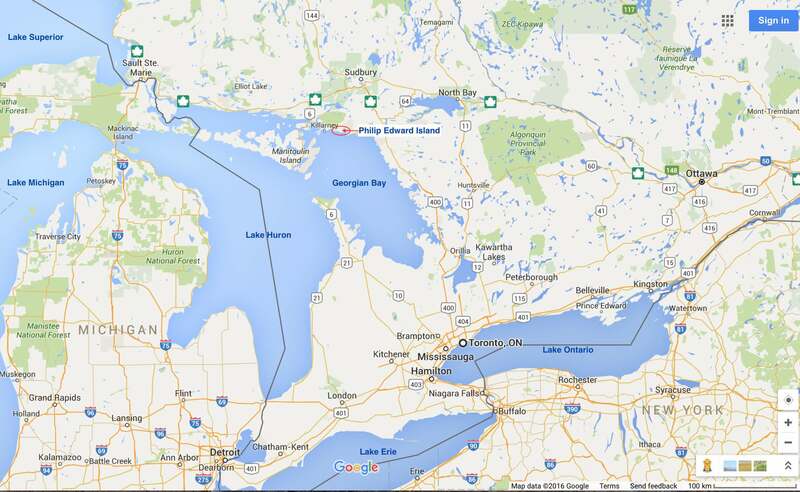 We were looking for another great paddle destination that was a short drive from southern Ontario. 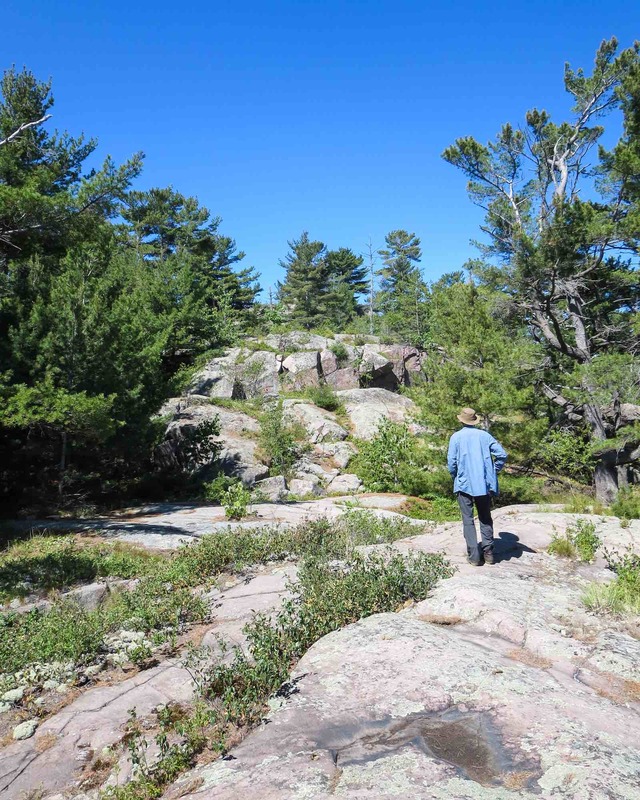 We also wanted a fairly isolated route that had the feel of wilderness and was not in a park that required campsites to be booked and paid for before we set off. 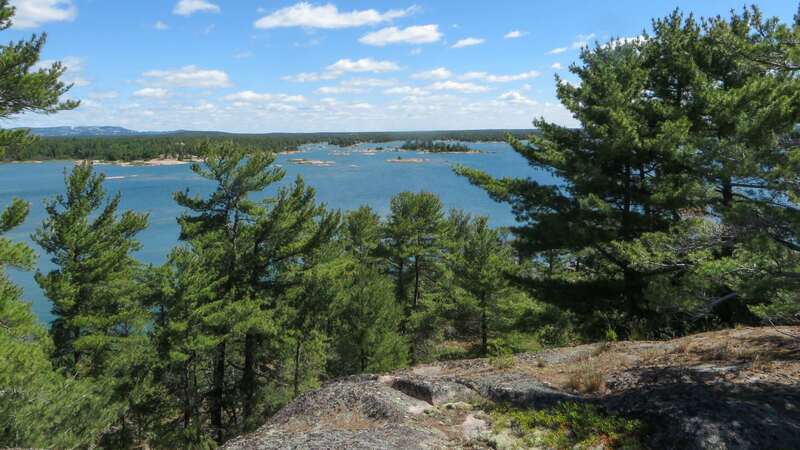 That eliminated Algonquin and Killarney Provincial Parks, among others, from the list. 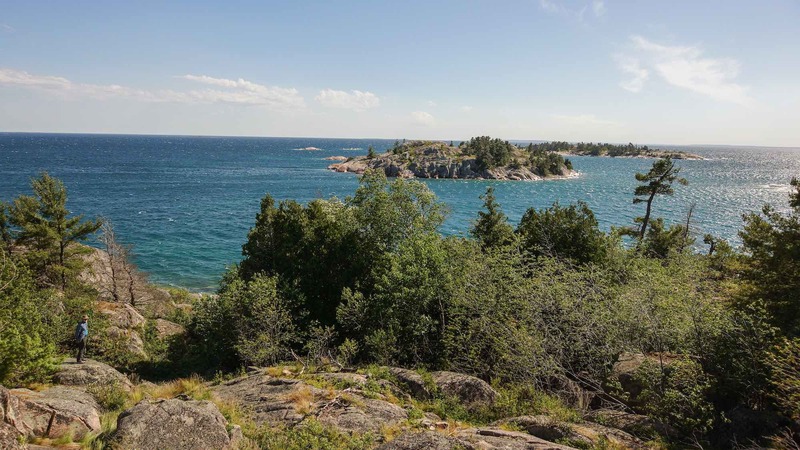 Well, we found it at the north end of Georgian Bay after a five-hour drive from downtown Toronto – and as a bonus, there would be no portages to deal with! 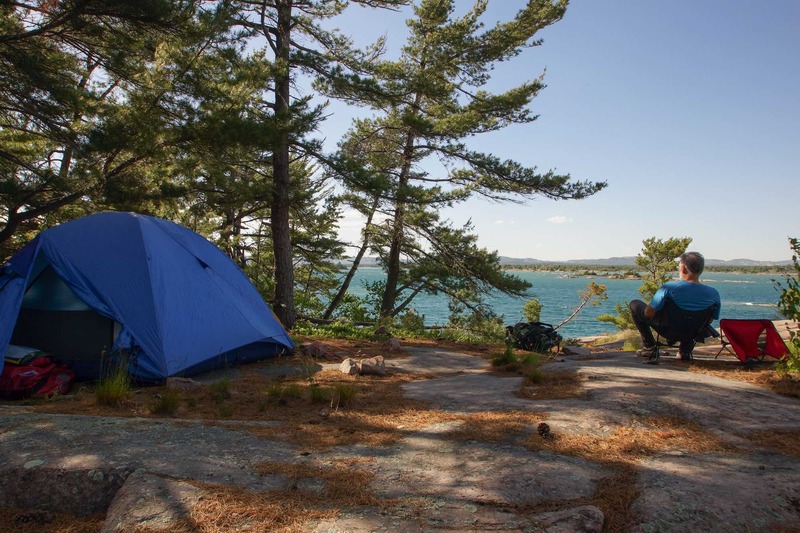 And since the various islands are still Crown Land, there would be no camp fees to pay either. 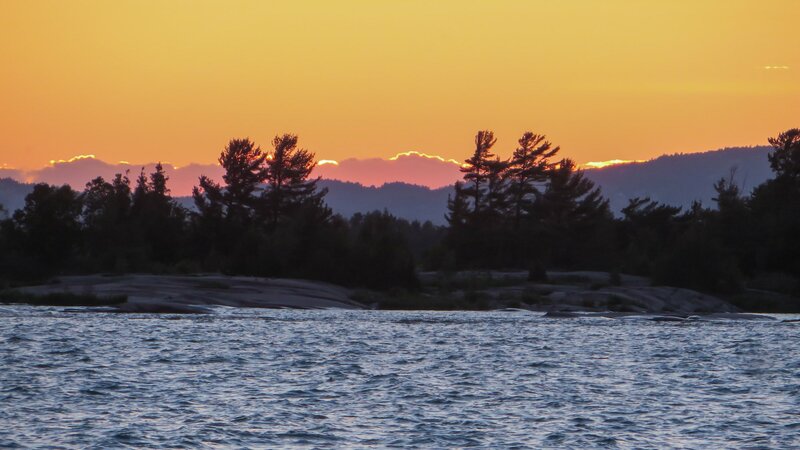 Our only real concern was the weather – in particular, the NW or SW winds that can make sitting in an open canoe on Georgian Bay a real challenge. Rain and 35 km/hour winds were forecast for the afternoon of our put-in. 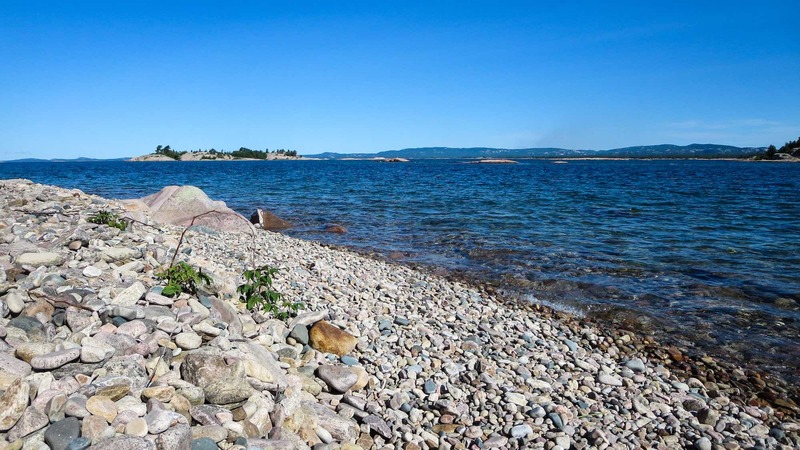 To Do What: Paddle around Philip Edward Island at the north end of Georgian Bay, which is sometimes referred to as the sixth Great Lake. 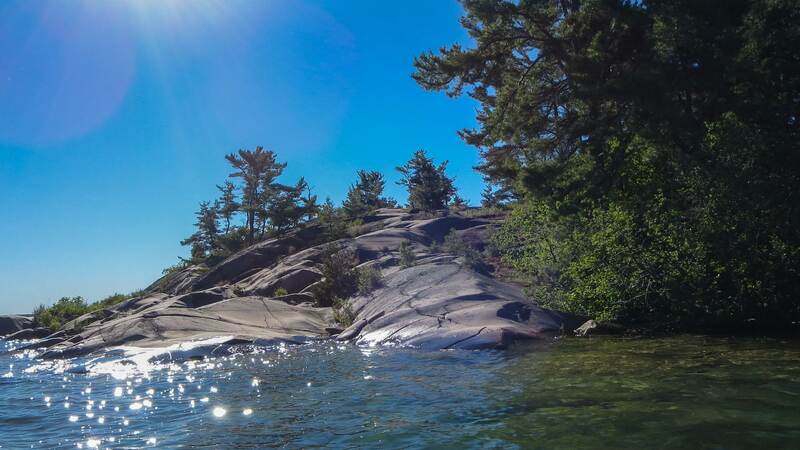 Why Go: Scenic paddling through the maze of islands on the Georgian Bay side of the island and then a return via Collins Inlet, a protected “inside passage” that includes an Anishinaabe (i.e. Ojibwe) pictograph site. The map below shows the route. Most paddlers choose to do it in a counter-clockwise direction, given the prevailing winds. So did we. We drove up Highway 400 from downtown T.O. on a Monday morning. 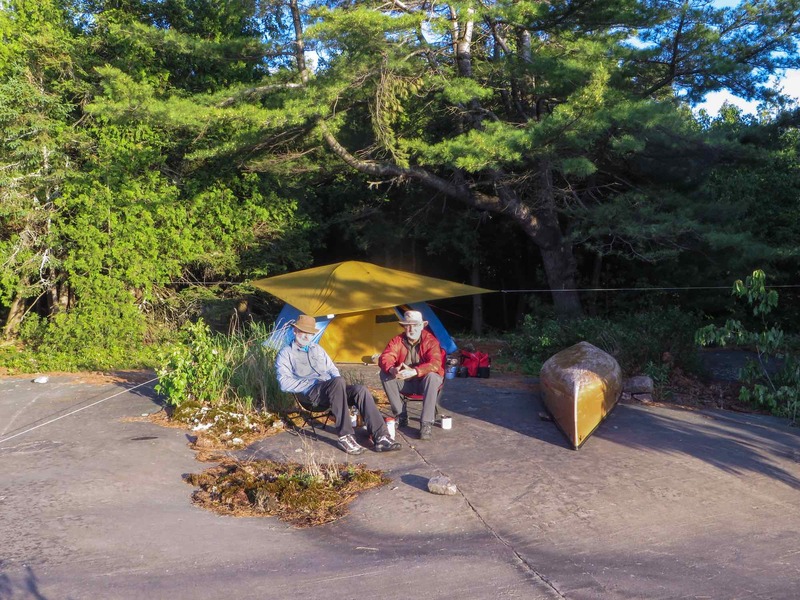 Our 7:00 a.m. departure meant that by noon we were at the Killarney Provincial Park’s George Lake information desk. While the camping would be free, the car would be sitting in Park property at the Chikanishing River put-in just 1.5 kilometers away. $14.50 a day for four days is what it would cost. Perhaps we could have parked our car at the Killarney Outfitters down the road a bit – or even somewhere in Killarney – but those options come with costs of their own and are much less convenient. 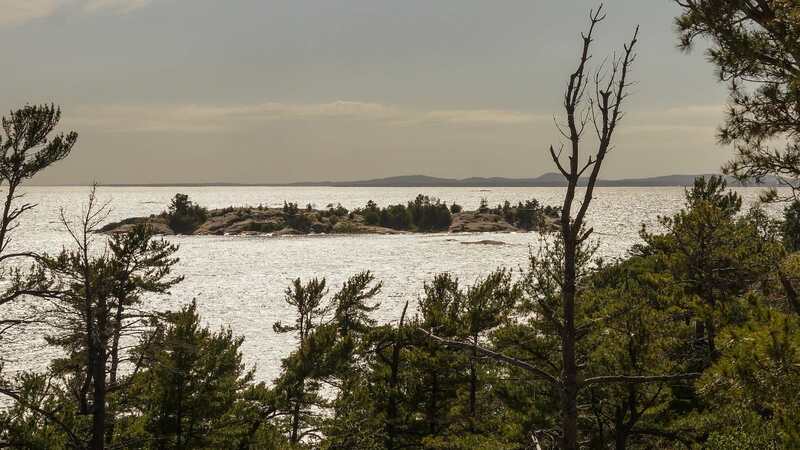 It is, for example, almost a ten-kilometer paddle over some pretty open water from the village of Killarney to the western tip of Philip Edward Island, oddly named South Point. From the mouth of the Chikanishing (apparently pronounced Chick a nish ing) it is 700 meters! Much better – and safer – to spend the $60. and reduce potential troubles. As we were getting ready to head out, another party of two canoes was just returning from a great four-day adventure of their own. They had paddled out to the Foxes, a small collection of islands off the west end of Philip Edward Island (P.E.I. from now on!) and camped on a couple of them. We were reassured when they said that the wind and waves they met on their return were manageable. A short paddle down a very tranquil and sheltered stretch of the Chikanishing River to its mouth – less than a kilometer – and we were looking at the Bay. So far, so good! Next on tap – dealing with the crossing. The conditions were nowhere as bad as we had expected, given the weather reports for the day. Had it been really bad, short of turning back, the plan had been to paddle east towards the Western Entrance and then come back along the shore to go around South Point. On this day – no need for Plan B. 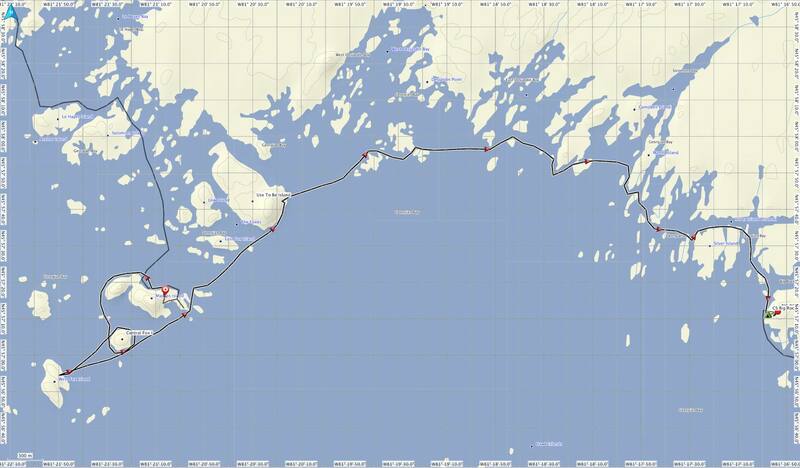 A 700-meter paddle across the open stretch and we were rounding South Point. All along the Georgian Bay side of P.E.I. 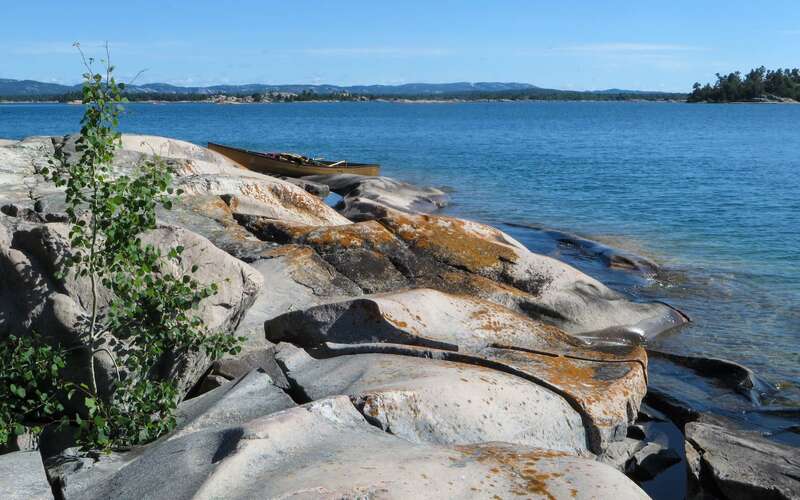 rocks and islands – some treed and some not – provide protection from the wind and the waves. We made use of them as we paddled towards the day’s destination. The map above shows the path we took. Another day and different wind conditions and the path would probably have been a bit different. What it still would have been, however, is incredibly scenic. Our goal was Martin’s Island, the largest of the Fox Island group. 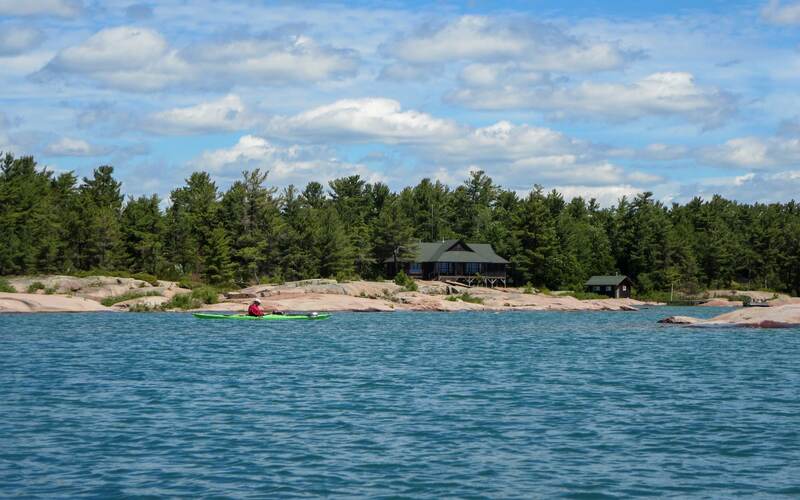 It was about a ten-kilometer paddle from the put-in and by 4:30 our tent was up on the island. 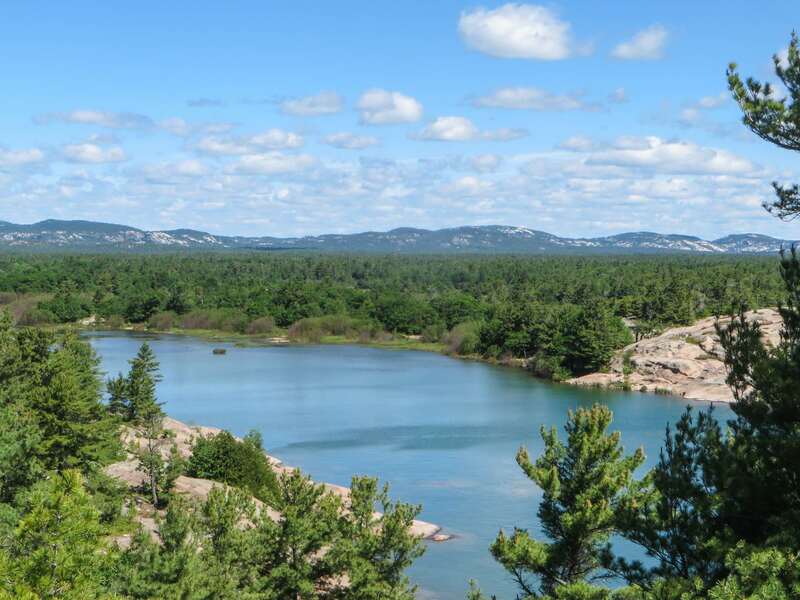 From the Bay side, the La Cloche Range was often visible in the distance, the white quartzite hazy in the afternoons, as in the pic above, and clear in the mornings. 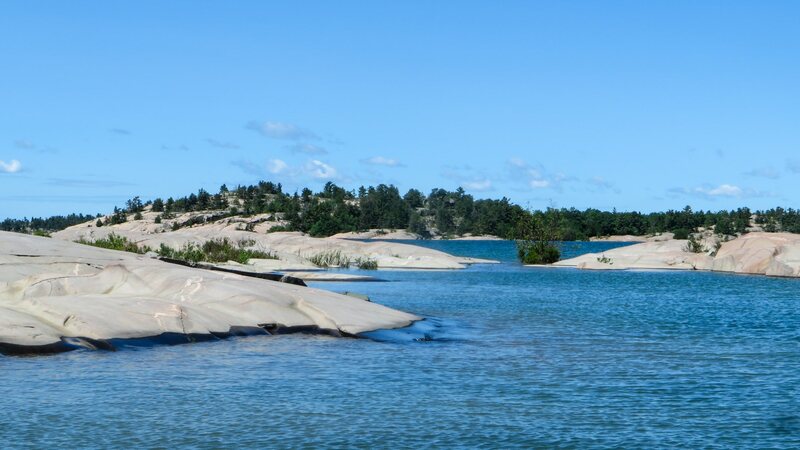 In the foreground would be wave-smoothed rock surfaces and, at least up close, the crystal clear water of Georgian Bay. Missing were fellow paddlers! 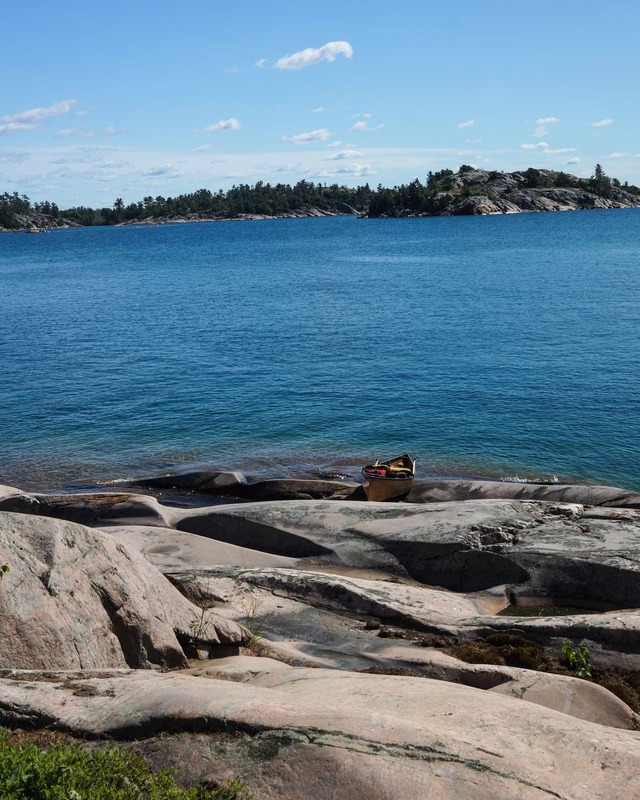 During the four days we spent out there, we saw one solo kayaker and two in a canoe. We were amazed to find a “thunderbox” just behind our campsite on Martin’s Island. “Props” to the folks who took the time to make and haul the box and toilet seat out there and set it up. 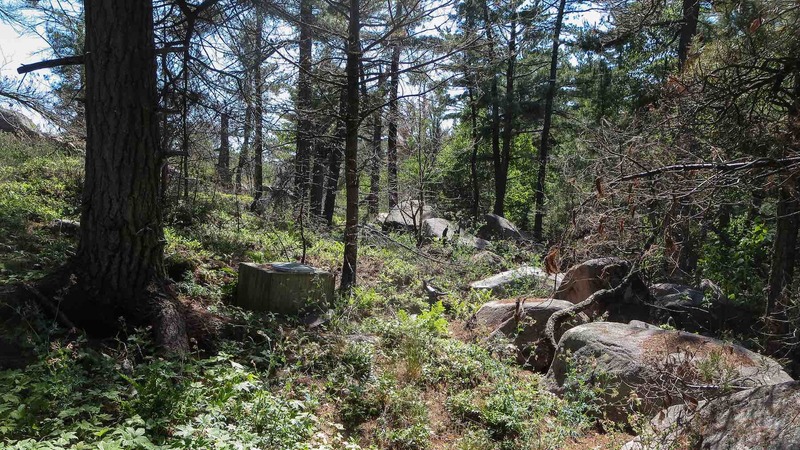 Maybe it was members of the Friends of Killarney Park although P.E.I. 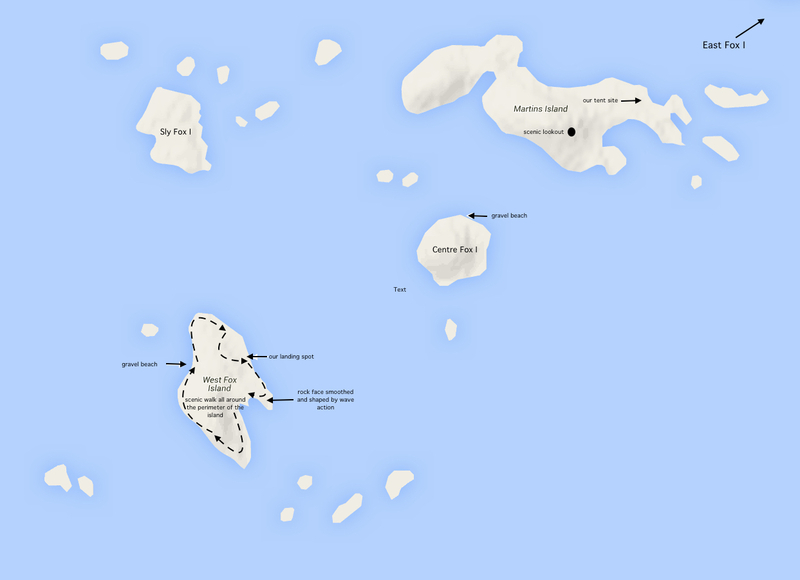 and the other offshore islands are not actually a part of the Park. We saw no examples of littering and garbage dumping and toilet paper strewn about on any of the islands we visited and walked and camped on. We were also surprised to find that we had cell phone coverage! We always take a Spot Connect along so that the folks at home can see where we are and how it’s going. Well, on this trip we could phone home at the end of each day. We’re betting that within our lifetimes – that would be maybe another twenty years! – we’ll be able to phone home no matter where we go canoeing! From our campsite we rambled around some of the island, taking in the views and enjoying the weather. By late afternoon the winds had indeed picked up significantly and we were glad to have done our paddling when we did. A few days later back at the parking lot we talked to a couple of other paddlers who had arrived at the put-in three hours after we did and who had decided to turn back up the Chikanishing when they saw how rough the water of the Bay was. 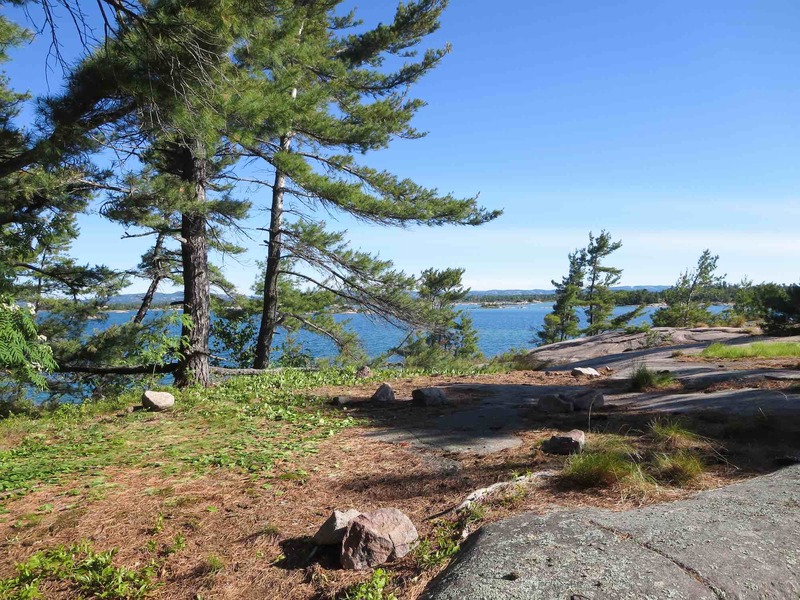 From a viewpoint on the south side of Martin’s Island, we checked out two other islands of the Fox group – Center Fox and West Fox. 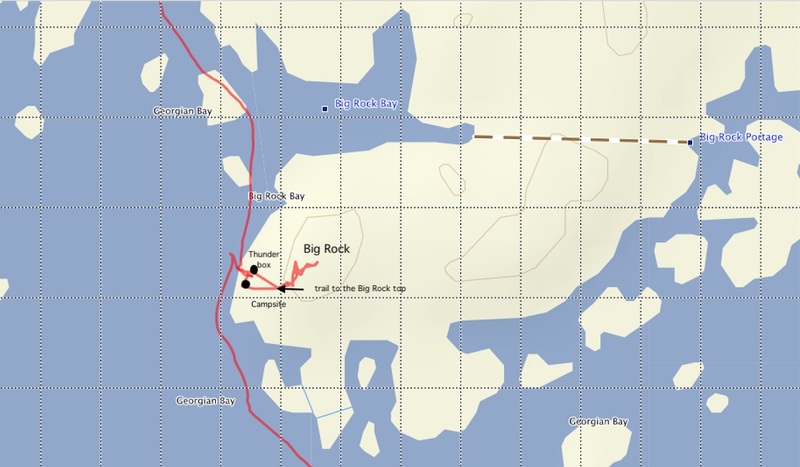 The plan for early the next morning was to pay them a visit before continuing east towards Big Rock Bay. 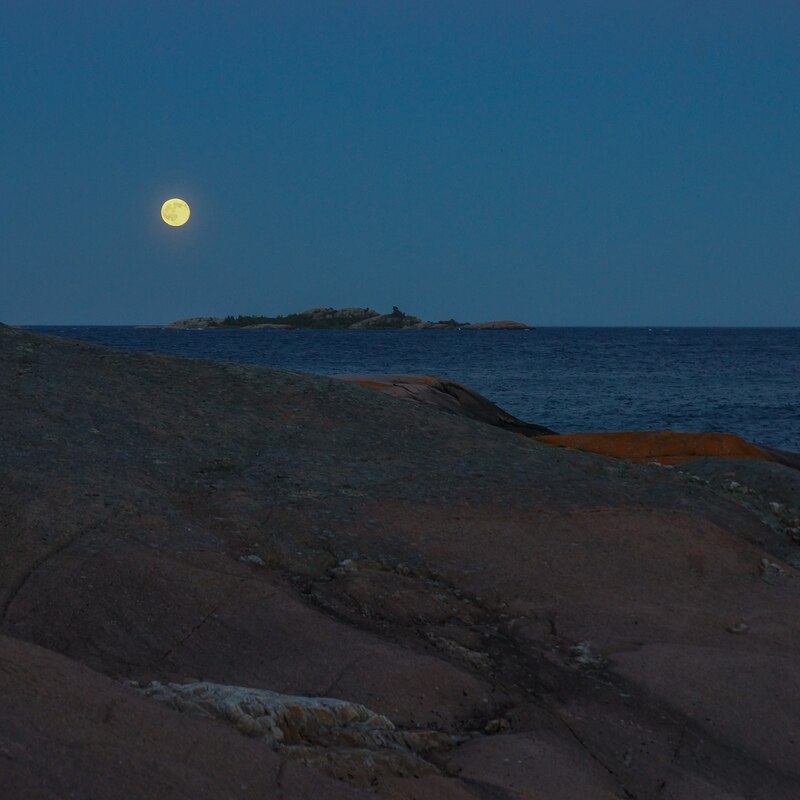 Our Martin’s Island camp coincided with the full moon. 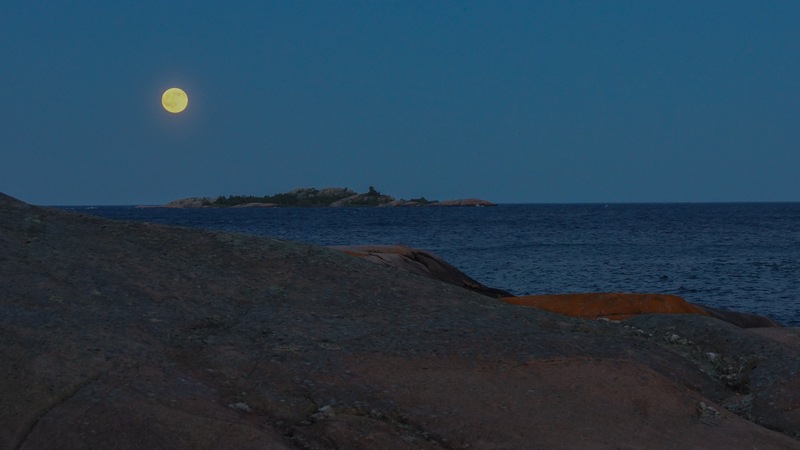 The shots below were taken from the east end of the island after dusk. My 2.4-kilogram tripod was up the hill at the campsite so we had to improvise in order to use a slower shutter speed. The iso was still upped to 6400. So much for dynamic range! 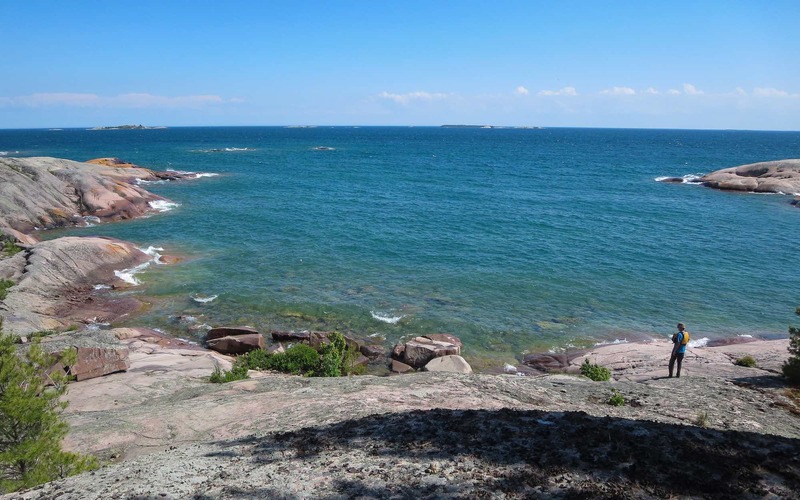 A 9:00 a.m. start – a bit later than we had planned – turned out to be fine since the waves posed no problems as we headed west along the shore of Martin’s Island from our hilltop campsite. The site had been nicely sheltered from the winds the previous afternoon and evening and had provided great views to the north as we relaxed in our Helinox chairs and sipped on our Sortilege. our Martin’s I. tent spot the next morning – sans tent! The pic below – shooting into the morning sun always makes for special effects! 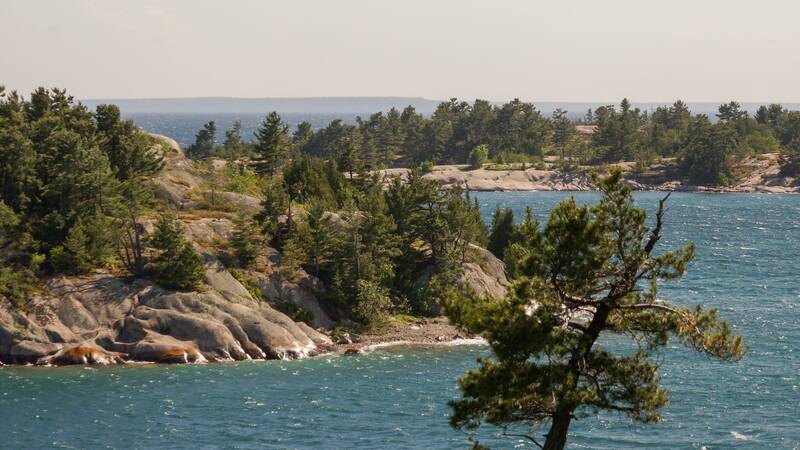 – shows the rock we camped on the top of. On our way to West Fox Island, we did take a look at Centre Fox. the evening before I had taken a shot of the west end of the island and its gravel beach. Now we paddled all around the island and found out that the beach was really the only good landing spot! a morning view from the gravel beach on Center Fox I. 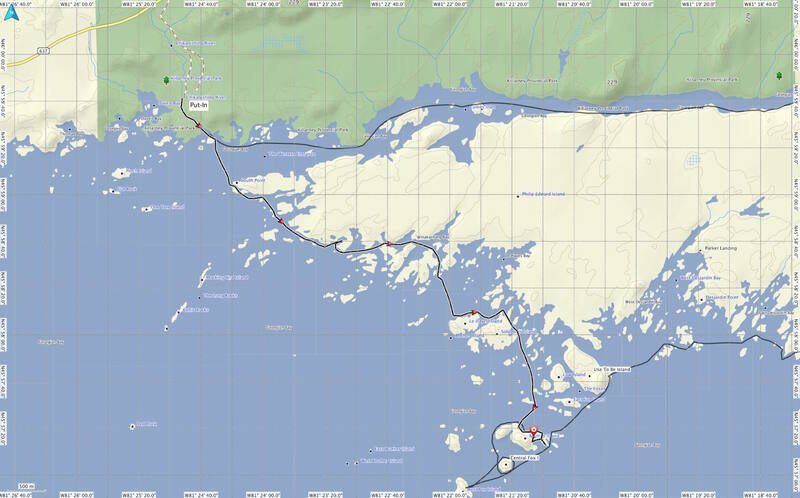 We decided to push on the West Fox and, as a map below shows, beached on the east side of the island and spent about 40 minutes on a 1.2-kilometer walk around the perimeter of the island. What we found were a number of excellent campsite possibilities and a variety of eye-catching views to frame in our viewfinders. 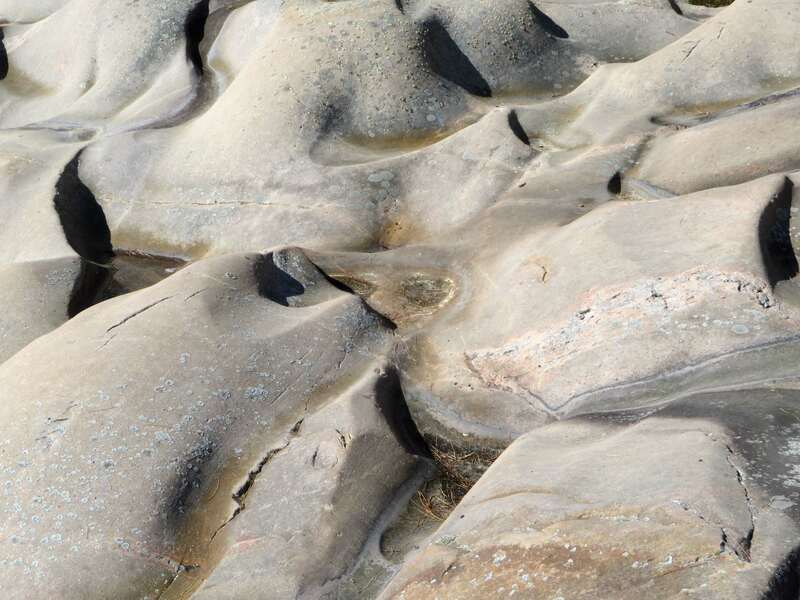 The pix below show a little of what caught our attention, beginning with the wave-like shapes of the water-smoothed rocks at the island’s east end. 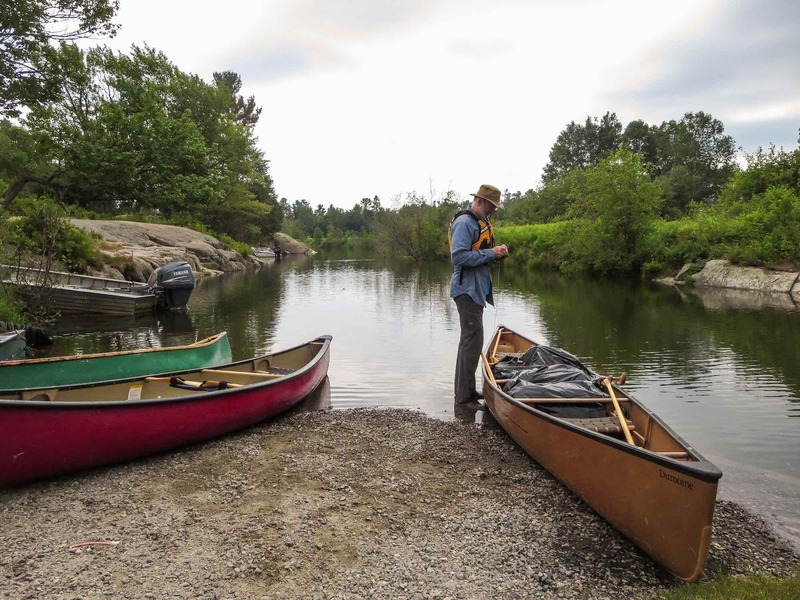 As we came back to our canoe we met a fellow paddler, a kayaker who had spent the night on the island. He was heading to the east end of P.E.I. 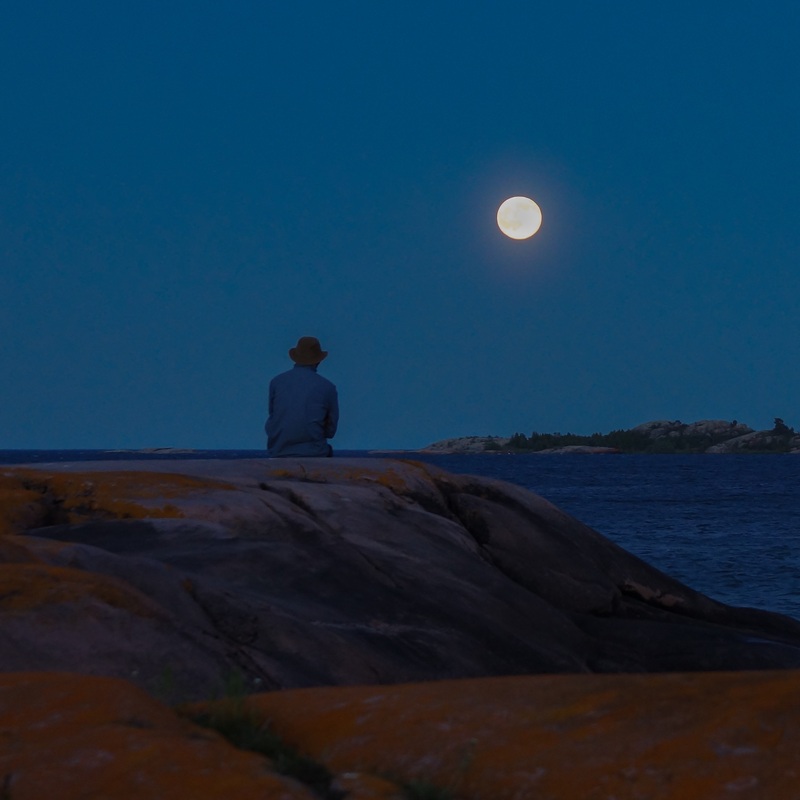 just like we were – and later that day we would see him again. 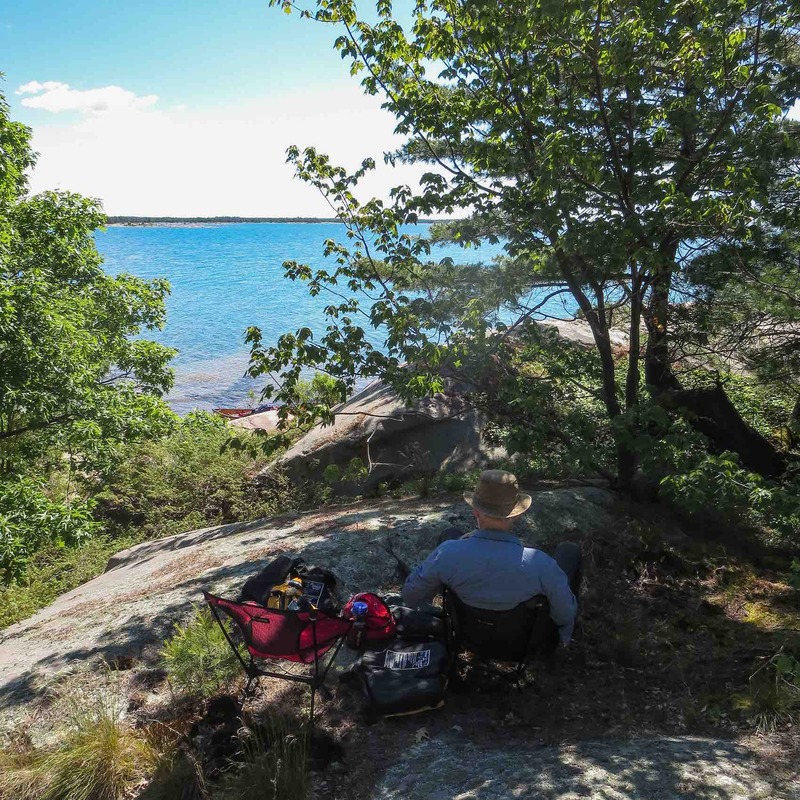 Our weather luck held out and we had fine wind and wave conditions as we headed north past Martin’s Island and East Fox Island before stopping for lunch in a shady cove on the east side of Used-To-Be Island (which is still an island!). Lunch done we went for a walk north of where we were sitting in the shade and came to what was obviously a popular large campsite as indicated by a couple of fire circles. Behind us was also a possible path to a hilltop viewpoint from which we could scan eastward towards the Desjardin Bays and beyond. I’ll admit that given the heat my first impulse was to say “Forget it, it’s too hot to be scrambling up there” but Max persisted so I figured “Okay, let’s git ‘er dun then” and up we went, rock climbing in our L.L. Bean boots! Five or ten minutes later – “See, that wasn’t so bad!” – we had our reward – a fantastic view of the neighbourhood we’d be paddling through over the next couple of hours. Back to the canoe and it was time to move on, still having no more than moderate winds to deal with on a sunny afternoon in paddlers’ paradise. We’d see our kayaker again mid-afternoon, some distance from us as we passed a cottage on P.E.I. During the trip, we did see a few cottages and camps scattered about the big island and on some of the smaller ones but our trip dates – Monday, June 20 to Thursday, June 23 – meant that the prime summer season had not yet started and we also avoided the weekend crowd. 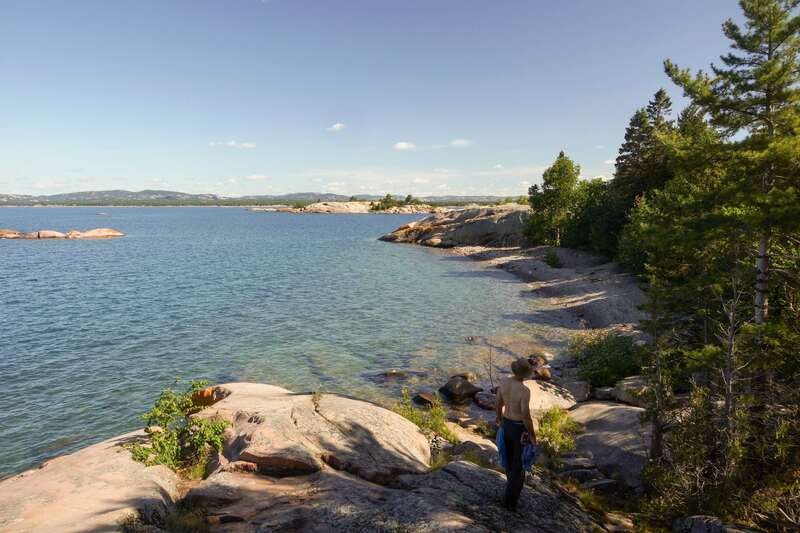 We found a terrific campsite just south of Big Rock Bay and below the Big Rock itself. Our front yard was the gently sloping and smooth rock you see in the pic below. It leads up to a nice flat area tucked on the edge of some tall evergreens that provide wind protection. As we would find out they also provided the pine tar which dripped onto our tent fly! Cooler evening temperatures did slow down the drips. For the second night in a row, our site would include a thunderbox, this one just a bit north and in the woods from the tent site. Also behind the tent was the three-minute path to the top of Big Rock. We went up in the early evening for a look and decided to return in the morning to take some pictures when the sun would be in the east behind our backs as we shot west and north. some pix of the fabulous view from the top of Big Rock. 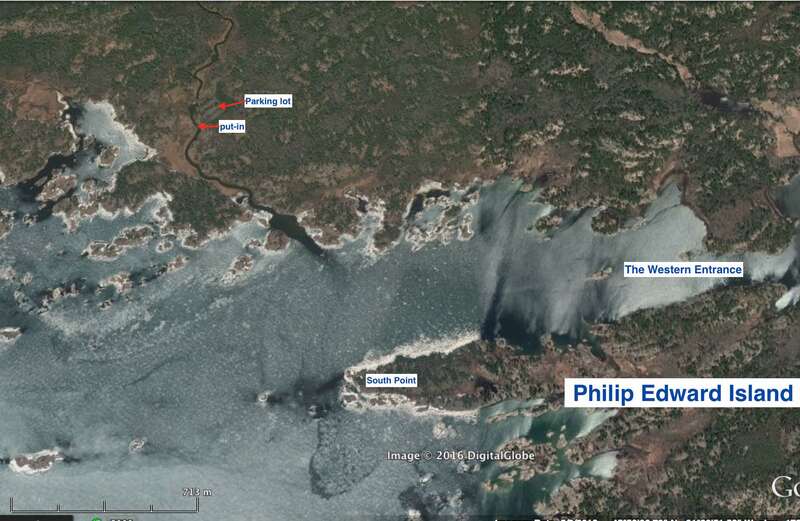 and an analysis of the Ojibwe pictograph site just west of Ambush Narrows. and what to read in planning your own trip around Killarney’s Philip Edward Island. 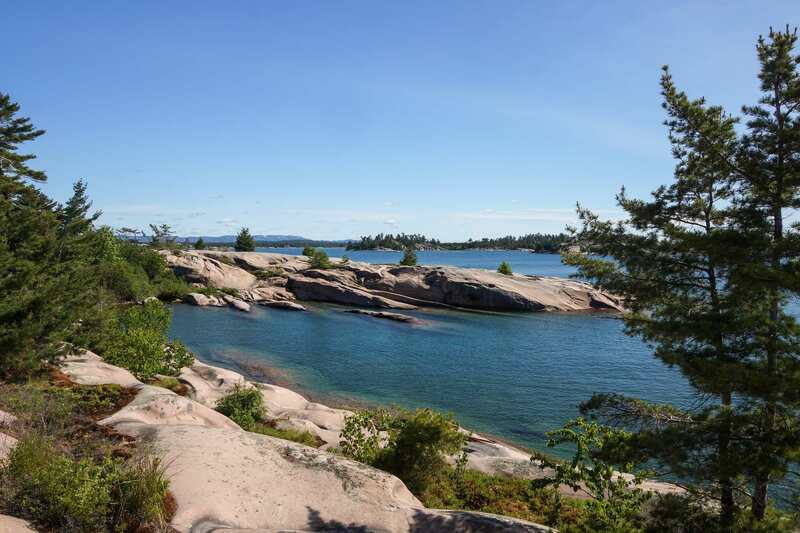 This entry was posted in Georgian Bay, wilderness canoe tripping and tagged Big Rock Bay camp, Chikanishing boat launch, Fox Islands kayak, Georgian Bay canoe trip, La Cloche Range, Martin's Island camp, Philip Edward island loop, Used To Be Island views. Bookmark the permalink. Hi there, I’m the solo kayaker in your submission! Really enjoyed your post and plan to use your tips in my next trip there. Ken, small world! 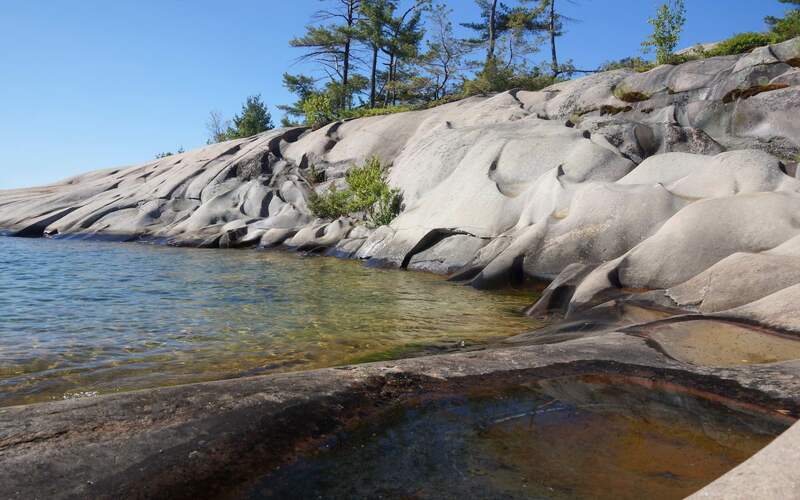 It helps that we are drawn to the same Georgian Bay “eye candy”! 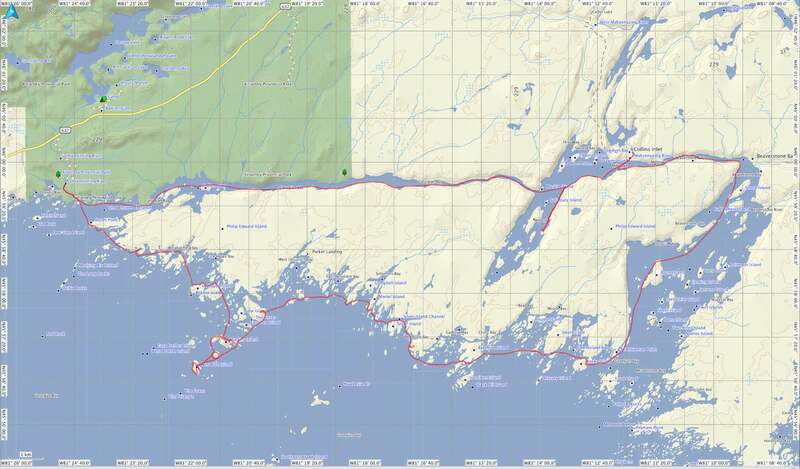 Just got back this aft from a seven-day kayak trip down the coast to Snug Harbour from Killarney. 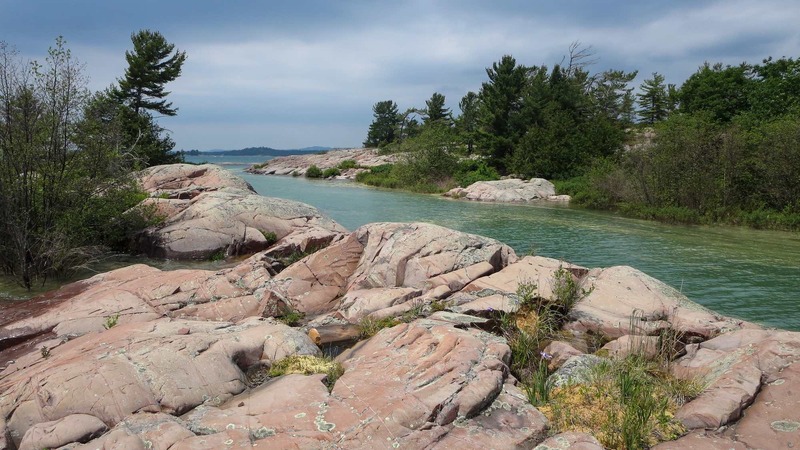 More great waterscape, interesting history, and a string of excellent campsites…I could easily get into kayaking! What is the road like down to Collins inlet village. They say it is just a logging road and one would need 4 wheel drive. We were thinking of using it as a take out.?? The only road off Highway 637 that we’ve used is the one to the Chikanishing Creek parking lot. That is where we put in. We stopped at the park office on the way in and paid $14.50 a day for the parking permit. We were there four days. Some maps do indicate a road that you might be thinking of. 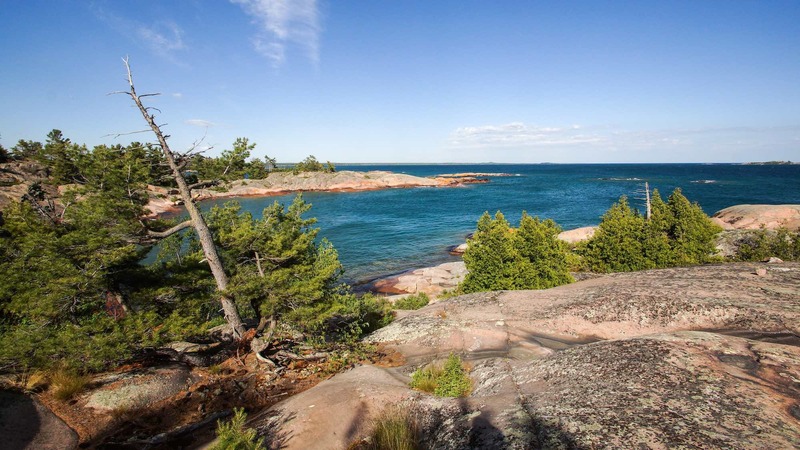 From Highway 637 it goes through Crown Land and then the Point Grondine Reserve and Park which is Ojibwe territory. It ends up at the remains of the privately-owned and for-sale derelict Mahzenazing Lodge. However, I recall seeing a real estate posting for the property and it noted that the property was boat-access only. I have no idea if a drivable road exits and is open and usable. Not sure where you would park your vehicle either. One choice would be in Park Grondine where you would pay a parking fee similar to the one we paid at the Killarney Park office on 637. 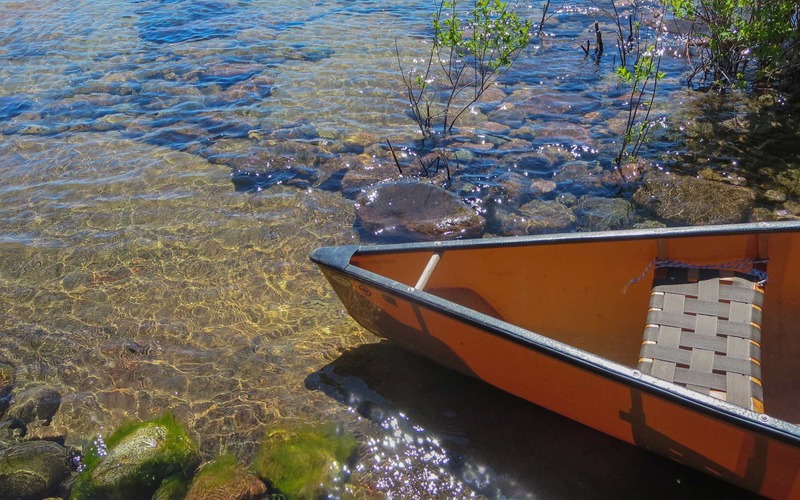 Then you’d have to spend a day paddling to Collins Inlet on the Mahzenazing River! Even if the road was open and usable you would only end up at the private property of the for-sale Lodge and you’d be staring at all these signs that say – “Private Property/Keep off”! Your best bet is the Chikanishing Creek parking lot! BTW – there is no village at Collins Inlet Village! There is nothing there except for a half-dozen falling apart cabins of various sizes. We paddled toards it thinking we’d maybe have lunch at the restaurant! Thanks so much for the information. We were just looking for a take-out instead of paddling all the way back through the Collins Inlet west to the Chikanishing Creek put-in. The Canoe in our group is going to leave the group and take-off early and I was looking for a take-out for them near Beaverstone bay or Collins Inlet. The rest of the group will be paddling to take out at Keye harbor.